Godly fear equips us to handle life God’s way—and everything that comes with it. From abundance, resources, to betrayal. Godly fear moves a person to immediate obedience…even when everyone else is doing something that the world calls okay—but God calls sin. Abraham obeyed God instantly, even when it didn’t make sense to him, when it was extremely painful, and with no promised benefits—but Abraham still went the distance. He obeyed God. Obeying God is one of the necessary steps in receiving God’s greatest blessings—and the most critical in the Christian life. It always blesses others, and we will never be disappointed in God. Abraham’s focus was not on abundance—but on the fear of the Lord. Focusing on the wrong thing can also open doors and even success—but may very well silence what God is saying to your heart, and even desensitize you to His voice, warnings, and last instruction. Immediate obedience is the outward evidence of a heart that loves and fears the Lord. When we fear God, we will obey Him instantly, when it doesn’t make sense to our natural minds, when we don’t see benefits, even if it hurts, and to the finish line. God asked Abraham to do what most people might say is unthinkable. God instructs Abraham to sacrifice the greatest promise of his life; the one he had waited on for many years. And guess what? God didn’t explain it to him either. We must learn to see the beauty and benefit of obeying God. Abraham went the distance through three days of travel. Abraham didn’t have the written Word—the Bible—like we have today to give him encouragement. Abraham obeyed God—climbs the mountain, builds the altar, ties Isaac (his promised son) up, and is about to thrust the knife into his son’s heart. Suddenly, an angel appears and cries out: “Do not lay your hand on the lad, or do anything to him; for now I know that you fear God” (Genesis 22:12). The angel knew Abraham feared God because he obeyed immediately. Godly fear moves us to obedience and equips us to handle God’s blessings here on earth. “The blessing of the Lord makes one rich, and He adds no sorrow with it” (Proverbs 10:22). “That perfume was worth a year’s wages. It should have been sold and the money given to the poor,” he said (John 12:5 NLT). His worldly thinking, reasoning, and logical comment was persuasive to the other disciples—as they too went along with the crowd to condemn her actions. It’s never wisdom to go along with the crowd. We must learn to hear the voice of God and obey Him. Jesus corrected Judas by saying, “Leave her alone. Why criticize her for doing a good thing to me?…This woman’s deed will be remembered and discussed” (Mark 14:6, 9 NLT). We can see that Jesus identified her action as good and lasting, while Judas judged her behavior as bad and fleeting. Judas was not thinking correctly and his discernment was way off. Judas went on to betray the Son of God—Jesus. However, once Jesus was condemned to die, Judas realized he was wrong and hung himself. His worldly, warped thinking and his plan of action did not accomplish what he thought it would. Abraham and Judas clearly demonstrate the difference between a person who fears God and one who does not. Abraham operated in discernment—while Judas operated in deception. The outcomes of these two mens lives were drastically different. We each need a pure heart that is quick to obey God. Without a pure heart, the enemy can cloud the mind through the world system, what everyone is doing, and improper heart motives. When we cry out to God and love the Lord, we want to hear what He has to say. He reveals all hidden truth and shows us things to come. While we may experience betrayal in this life, we will surely know we have been warned by God. Never ignore the warnings and nudges from the Holy Spirit (or checks in your spirit). Your obedience to God—from small to big things—will reveal where you are presently. Don’t cruise along in life—until one day it is too late. God sends small checks in our spirits to warn us of impending danger. Don’t allow your conscience to be seared through desensitization by the things of the world. “Things nor abundance” are wrong in themselves, it is when they turn into greed and selfishness that it is sin. This world is not our home—we are passing through. Choose to know God and make Him known. The fear of the LORD is the beginning of wisdom (Proverbs 9:10). The fear of the Lord is respect, awe, and submission to God. There is nothing more important in life than maintaining godly fear. Pray and ask God to open your eyes to see yourself the way He sees you—and to see others the way God sees them. Every person is highly valuable to God. Everyone is level at the cross of Jesus Christ. 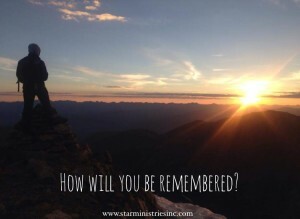 So, how will you be remembered? As one who would sell others out for worldly comfort, convenience, pleasures, and gain—or one who obeys God at all costs and immediately. Choose to seek Godly wisdom and the fear of the Lord. You will never regret that choice. GOD’S PRICELESS TREASURE (How To Overcome Challenges, Be Transformed and Know Your Purpose)….. how to move from drama to destiny, pain to purpose, and a mess to a message. A LEAP OF FAITH (25 Days At The Mercy Seat)…the full account of God’s divine intervention, resurrection power, and miracles on a daily basis….you will be changed forever. THE MIDNIGHT HOUR (Will America Turn Back To God? )… a must read for every leader.